Some history here, you have to go back to the 1953 Evinrude Fastwin 15 hp. That motor was improved somewhat to make it quieter in 1955, but still 15 hp. The 15 hp was added to the Johnson lineup in 1956. In 1957 the cylinder bore size was increased to 2-1/2 inches, increasing the displacement to 22 cubic inches and horsepower to 18hp for the FD-11. In 1966, Johnson modified the 18hp a bit to make up it's horsepower. Another note, if it is an Evinrude 'Fastwin' AND says '15 hp' on it, it's a '53-'56. Johnson and Evinrude totally combined their product line in 1956 and the 15hp was available in the Johnson marquee, as well. These were a carry over of models made by Johnson and Evinrude then the merger with Evinrude in 1956 when the OMC company was formed. These motors are essentially bigger brothers of the Johnson 10 hp QD motors. With many parts interchanged between them all. The 15 hp Johnson motors, were started being built in 1956. 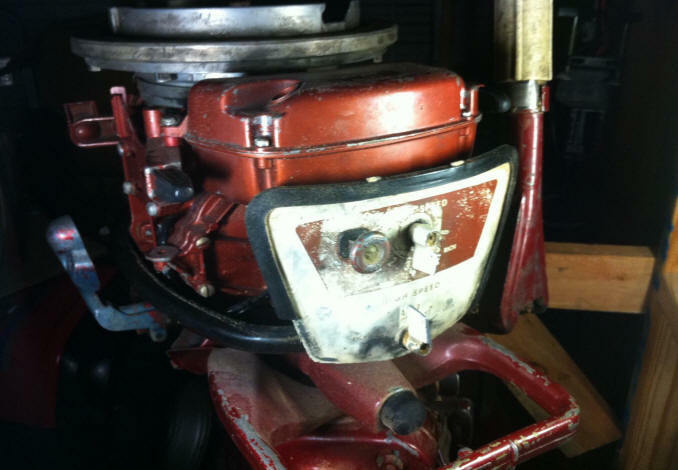 It's 18hp big brother came into being from 1957 to 1965 for Johnson while the Evinrude brand ran up to 1973. So you can see that the motors of this era had a close family relationship and parts interchangeability. The 15's were originally built by Evinrude from '53 on to '56 and had 19.94 CI. An excellent improvement over the 14's of 1950 and 51. The FD/Fastwin was even more improved in 1957 and was bumped up to 22CI. to become the 18HP FD-11. This 22 cube design was actually the base design for two more models up until 1976. 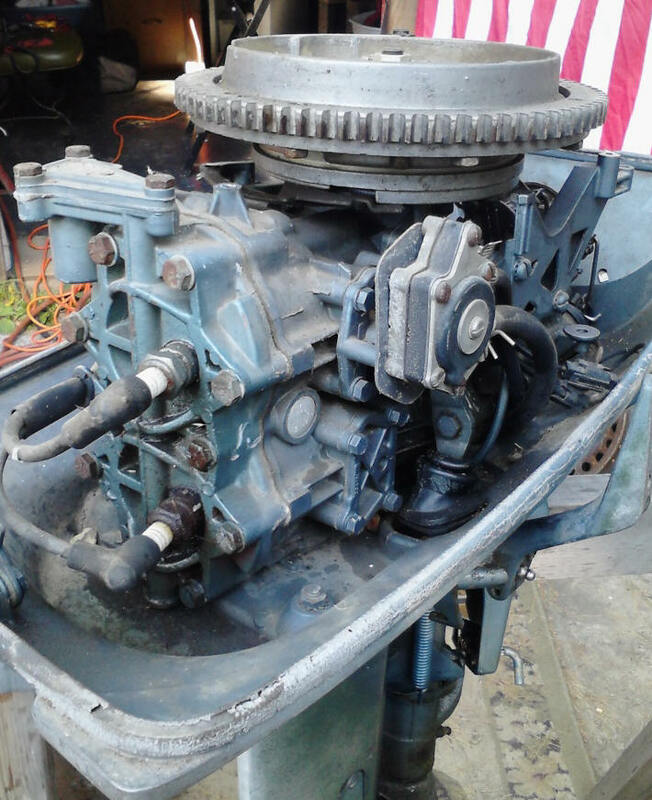 An 18hp powerhead should mount on the 15 midsection and work fine, since this part was the same other than the bore size/displacement, from 1956 - 58. The 22 cubic inch motor continued to be made as an 18 hp by Evinrude and as the 20 hp by Johnson. In 1974, the same motor was again modified to produce 25 hp, from the same 22 cubic inches, and sold along side the 18 - 20hp. Carburetion being the main improvement. The 20hp of 1966 and the 25hp of 1969. One of the best designs ever built by OMC. The reliability is good in all the years that they were built (1957 - 73) but after 1958, when they went to that fiberglass hood set up, that was the only drawback. Those little rubber shroud mounts usually are broke, and if you decide to grab the fiberglass lid to beach the motor? HAH! You only end up with a lid in your hand. The best 18's were built in '57 and "58 with the good old aluminum clamshell covers. No plastic parts and they were tough as bullets. In the late 1970's the 22 cubic inch motor was dropped, and replaced by a much different design making 35hp. The 35hp was detuned to make several versions producing 20, 25, 30hp. But not the same motor as the old 22 cubic incher. The colors for the early motors were for the Johnson a metallic crimson/brown with white trim while the Evinrude metallic bright blue and white trim. The later motors, the Johnsons were white while the Evinrudes had a deeper blue lower pan and shaft housings with a white cowling. The year of manufacture for these models of motors are listed in the chart below. It also appears that the long-shaft motors were not made until 1957 after OMC was formed a year earlier. The "L" in the model number designates it being a Long Shaft. The "E" would indicate electric start. There should be the model and serial number on riveted on 1” X 2” aluminum ID plate on the LH side of the transom mount bracket (looking forward). For Evinrude, the model numbers for instance the 1960 model 15032 would usually be a short shaft motor, while the 15033 would be a long shaft. Evinrude made the 18hp from 1957 up until 1973, and used a totally different model number system, click below for actual model number code to year made. Fuel Mix: These OMC older motors were apparently one of the first that were built WITH needle bearings in the crankshaft and rods. However they still use a bushing on the top, or piston end of the connecting rods. You will see may ideas on outboard message boards as to oil ratios, all the way from factory recommended at that time of 16-1 up to way higher. What they usually do not mention is the type, or quality of this oil being used. Oil technology has improved tremendously since these motors were made. By this, it originally only specified SAE 30 oil, now we have moved up to TWC-3 and beyond into synthetic oils (which have no newer coding) and have way more lubricating qualities. So in my book, even if you use the currently available standard marine TWC-3 you should have no real problem at 32-1, but if you use a FULL SYNTHETIC oil (like Amsoil), you can use the lower, more common later fuel mix of 50:1 gas to oil ratio and get by just fine for the average boater. However if you have a teenager who just has to see how fast it will go, for safety's sake, drop back to the richer mix. NOW the above being said, this does not pertain to HEAVY or EXTENDED high speed, (RPM) usage, as that is in a totally different situation. As I see it, the big problem is most of us do not start from a empty fuel tank when we fill up, so how do you really know what ratio you are getting? So where you have to mix the oil, you need to know how much gasoline you will be needing, and add the oil before you fill the fuel tank so that the oil mixes better that just dumping it in after you fuel up. However if that is not possible, initially guess on the amount of oil, add a majority of what you think it will take, fuel up and then add the rest of the oil matching the amount of gasoline you took on. If you are using portable 6 gallon fuel thanks, before hand, when you initially fill it, add 1 gallon at a time, use a clean 3/8" or 1/2" dowel and mark the dowel at each gallon, and then use it as a measuring stick. This way you can refill a partly full tank with the known amount of oil. Fuel Pump : These early motors prior to 1959 did not use a fuel pump as we know it, but utilized the 2 cycle principle of the motor of sucking fuel in, compressing it inside the crankcase, forcing it out into the cylinder. Usually there was a copper line coming off the intake manifold to the fuel connector which pumped pressure into the fuel tank using one line of a Siamese line. This pressurized the tank forcing the fuel into the motor thru the other line, just like a modern jet well pump. However, at that time a fuel pump kit was offered as an accessory on 10hp and up motors as it was needed for boats with built-in fuel tanks. These newer model fuel pumps bolt to the top by-pass cover and use the standard common single hose fuel line. hose fuel line. On the motor that I had access to for this article (a 1958 version) had the old Siamese twin fuel line. I had some junker parts off a QD 10hp that apparently was about a 1960 that had the bypass cover and the fuel pump attached. Doing some investigation, the only difference in the bypass cover was the size of the mounting bolts, which were one size smaller. This was quickly remedied by drilling out the holes to accept the larger bolts for this 18hp. If you are having problems where the indications point to fuel, double check the fuel lines or fittings/tank for leaks. The older tanks are pressurized (one line using pressure from the intake side of the motor, putting pressure into the tank, forcing fuel up the other line to the motor. These older systems can be repaired using newer aftermarket repair kits. However many boaters convert over to the newer single line tanks operate on a vacuum. To convert the older motors to a fuel pump here is a LINK on how I did one. Since these fuel pumps are obsolete, another method if you can not find the parts that I did, is to add a new style OMC fuel pump. This will require some sort of a mounting like seen in the RH photo below, and just hooking up the fuel lines. In the photos here you will see 3 different fuel pumps. The photo above and left will be the early style fuel pump. The photo, 2 photos below on the right is the later more rounded cover that died about 1973. No repair parts are available for either of these. The photo above right showing an adapter plate for the non fuel pump motor is the new fuel pump made from 1974 up until about 1987. If you have either one of the earlier pumps and it fails, the mounting holes are the same as the later small square fuel pump. You may have to get longer mounting bolts however. Front view of a 1958 18hp with the cowlings removed, showing the breather, choke, slow & high speed carburetor adjustments. Recommended Spark Plugs : The recommended spark plug was a Champion J6J, which is no longer available but replaced with a J6C. However with a well used motor most old time mechanics would recommend a hotter plug, like the J8C. Recoil Starter System : This unit is bolted onto the top of the block or brackets off it and held on by 3 bolts. Replacing Recoil Starter Rope : If you have to replace the starter rope, you will need to pre-wind the rope with spring tension so it will rewind. The simplest method would be to cut a small slot in the lower 1/2 of the spool at the red arrow in the photo below. What this does is allow just enough clearance so the rope will enter into this notch while rotating the spool while it is as seen below. Pull the rope out away from the housing, then in the gap at the arrow, pull the rope into the new notch, holding the rope there, rotate the spool, winding it tighter, taking in the excess rope onto the spool. Keep doing this until the rope will retract fully when you let go of it. 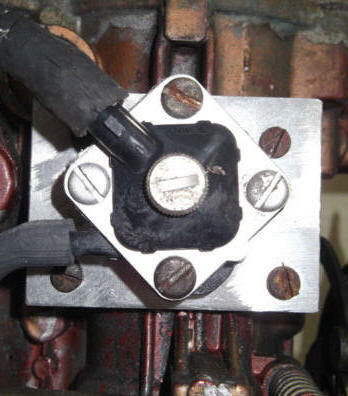 Electric Starter : This electric starter unit is bolted onto the block's front LH side. Note the electric choke solenoid laying partly under the carburetor. There was no charging system on these series of motors. Ignition System : On this series, they utilized the magneto system, or points/condenser and coils under the flywheel, which shared common parts with many of the other Johnson motors of the same era. The coils, especially those in the 60's motors have a reputation for cracking and allowing moisture in and then starting to break down, creating problems. They changed the plastic formulation on the coils at some stage and the replacement ones are fine. About 60% of the old motors I have had needed one or more coils replacing, and would be financially unviable for someone not working on their own motor. A lot of people will replace the coils without replacing the spark plug leads. Even if they do, often times the connection from the coil to the spark plug lead is not very good. The faces of the coils also have to be lined up with the machined face perfectly or you're spark will not be perfect. Those who run the old spark plug leads after changing the coils will often overlook the spark plug boot connections too. To adjust the points some versions have a "inspection hole" in the top of the flywheel, if so you do not have to remove the flywheel but can adjust the points thru this hole. If you do need to replace the points, you will need to remove the flywheel however. On some of these models (especially the early ones) they may have a spring loaded cam on the crank shaft. Or with the flywheel off, remove spring to install or set the points then use a thin screwdriver to hold the cam down while putting the flywheel 'mostly' on. On these if you do take the flywheel off, you may find it hard to get the flywheel back on because it is hard to get this cam to stay down while reinstalling the flywheel. (1) Use screwdriver to hold the cam down while putting the flywheel on, and if you're quick, it works. You may wish you have an extra set of hands though, or call a buddy over. (2) Or turn the shaft/cam to where it is just short of starting to open one set of points. Then the cam will slide down without interference. Now your ready to torque it on. Not too bad once you get the hang of it. One old time mechanic had a suggestion. If you are setting the points with the flywheel off on some of the early versions, you may find that holding this cam down while setting the points is a bother. You can made a short piece of tubing to hold the cam down while setting the points. The flywheel nut holds the tubing down, tubing holds the cam down. Double check your points gap, .020, anything more or less may throw timing off enough not to fire. These need to be set at the highest part of the cam lobes and if off just a slight bit can effect timing. Carburetor : The carburetor has both high speed and idle jets that are adjustable. The front motor panel of this later 1960 version shown below has a dual knob in the center. The outer knob is the high speed adjustment, which is marked from 1 to 6. The (supposed to be red) inner knob is the idle adjustment. The choke is in the normal LH side of this panel. The timing plate cam on this version angles downward as it extends to fast position. The cam roller is mounted on the front of the intake manifold, (shown in the photo below) instead of on the carburetor tops like the later ones are. It has a large breather box mounted directly above the carburetor and below the recoil starter pull knob. To work on these carburetor's you need to remove the bottom part (fuel bowl). With this off there is a pivoting cork float inside. At the short side is the fuel inlet coming into the carburetor thru a screw in brass jet. There is a needle that fits inside the jet. The float arm activates the needle. On this arm is also a tab that adjusts the float height, The normal float adjustment is with the bowl off and the needle/float in place the float should normally be parallel with the upper carburetor's body when the body is UPSIDE DOWN. There are 2 things that you need to look for here. (1) Be sure that the inlet needle is not stuck open or closed. (2) Check the float level, which should could be adjusted wrong, as described above. Carburetor needle valve adjustment. Tighten the packing nuts to tighten the needles and prevent sucking air around the shafts. You can rough set them in a test tank. Turn the needle jet shafts in until they lightly bottom out. Then back them out to the established preset number of turns. Low speed: open 1.5 turns. High Speed: open 3/4 turn. This will get the motor running, but it is best to do your final adjust the needles on the boat and under power. When on the lake, go to WOT and adjust the high speed to run at max rpm's. Then idle down to a troll and optimize the low speed. For this low speed, make about 1/4 of a turn at a time, allowing about 1/2 a minute for the carburetor to adjust to that setting. Then turn the carburetor idle screw knob (lean/rich) one way or the other until the motor changes and either runs worse or better. By rotating this knob a slight amount, let the motor run for a few minutes, rotate it slightly more in the same direction again. Doing this you are making the motor run richer or leaner at an idle (mixing more or less air into the idle mixture). Eventually you'll hit the point where the engine wants to die out or it will spit back (sounds like a mild backfire). At that point, back out 1/4 turn. Within that 1/4 turn, you'll find the smoothest slow speed setting and the smoothest the motor will run at slow speed. Twist grip Throttle : The linkage from the twist grip throttle is by meshing brass gears, as seen in the photo below. Thermostats : These show in the parts manuals to be the same from 5hp to 55hp for years 1959 to 1994. They may have slightly different configurations because of improvements, but they will all function no matter the shape or design. They can usually be removed, then cleaned up with no problems, UNLESS they are really contaminated because of debris or salt corrosion. Do not run outboard motors without a thermostat as they need to run at a warm enough temperature to be able to burn the lubricating oil mixed in with the gasoline. No Overboard Water Indicator : These motors were made before the common "pee hole" indicator was being used. There was just a "blubber hole" on the rear upper. However you could convert it over to the "Pee" type by using the same method used on this 6hp, CLICK HERE. Reed Valves : Stuck open reeds will keep the motor from being able to push fuel into the crankcase, thereby preventing it from starting. However, stuck open or closed reeds will have no effect on compression because the compression reading is off the top side of the piston. The reeds open and close, sucking fuel in from the carburetor because of the osculating suction/pressure off the bottom side of the pistons. If it's bad reeds, the motor should still crank up and start momentarily if fuel mix is sprayed directly into the spark plug holes. If you decide to pull the manifold to check the reeds, be very careful if you choose to pull the intake that you remove every screw! There are a couple of hard ones to spot inside the manifold that must be removed before it will come off. If you pry on the manifold with much force you are guaranteed to ruin it. However I wouldn't pull it unless it will start with fuel in the cylinders, but not without it. Motor Mounts : The rubber motor mounts are pretty well designed, a rubber block with attachment bolts molded into them last a long time and are externally mounted. The actual runner mount is the same for both the upper and lower, but the lower has a housing around it that also clamps onto the pivot shaft as shown in the LH photo below. There are other mounting that holds the lower upper cowling to the mid-section /clamping unit. These tend to have the bonding from the bolts to the rubber deteriorate and separate from the mounting bolts. It is also rather hard to remove the usually rusted nuts from the bolt studs to even try to re-bond the rubber. So probably the best would be to try to clean them, then Super Glue. The result is not detrimental to the running of the motor, except the upper cowling when snapped to the lower part has some movement and can make a rattling noise when running. Clamp Bracket Screws : These screws that hold the motor to the boat transom threads are 1/2" X 13 TPI or National Course. If you can not find any replacement ones then a simple 1/2 NC bolt 3" long or with at least 2" of threads, with a flat washer under the threaded end will suffice for a considerable time. It may just not be a pretty looking as the original, but it will hold the motor to the boat. Most of these screws are damaged by neglect of not maintaining them with a small amount of chassis grease or Vaseline before they rust or corrode in the bracket. Shown in the photo below is a built in location to use a chain from the motor to the boat for safety sake. 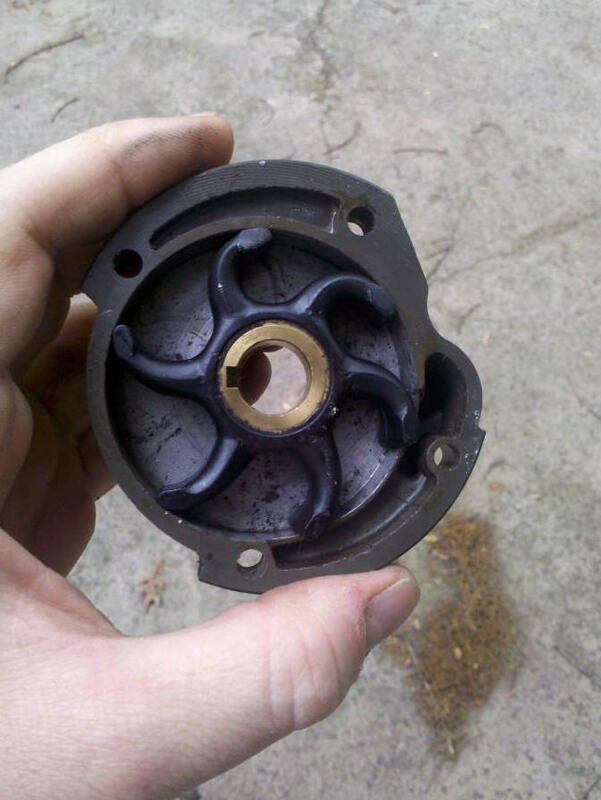 Water Pump Repair : This water pump impeller replace job is a simple remove 4 bolts at the lower unit to mid housing. 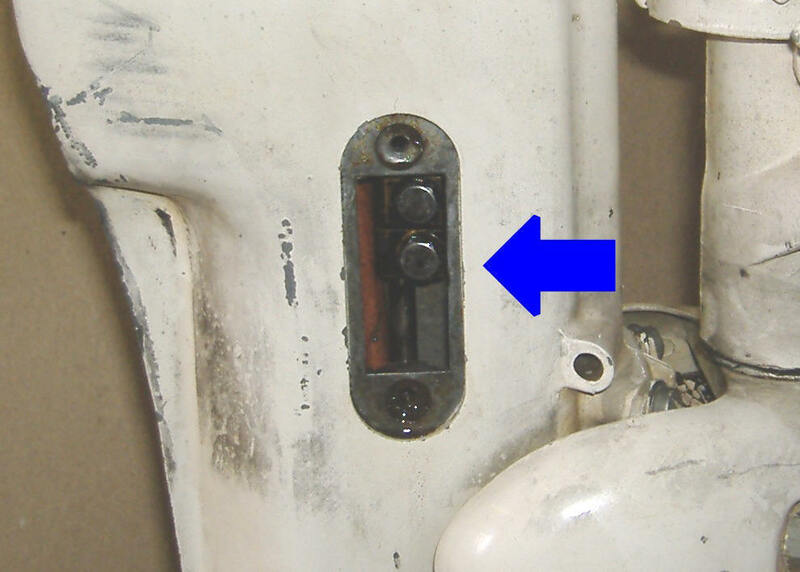 To access the shifting lever coupler when removing the lower unit, there is a small cover on the right hand side of the exhaust housing retained by a screw top and bottom. Removing this cover, you can then get to the coupler and remove the bottom screw to disengage the upper shifting rod from the lower rod in the lower unit. Now the lower unit should drop down, being loose from the rest of the motor. In replacing this screw upon reassembly be careful to get the groove that the screw goes into centered in the screw hole before you attempt to insert, tighten down the screw. The one I worked on had a tendency to slide up too far and could bind the screw when it was tightened, stripping the threads. A flashlight and slow movement of the shift lever is needed in this situation. Water pumps are basically the same design as still used on all outboard motors. These impellers are a larger diameter than on some of the later unitized lower units, in my book they appear to be able to still function even after many years of usage even after becoming less flexible. The one thing the early units, was that they were made of a pot-metal cast housing that after years of neglect, the normal deteriorated condition it will be well worn & or corroded inside (as shown below). It is then recommended to replace the pump unit with the newer nylon housing with a stainless steel liner version if you have plans on keeping this motor in your stable for some time. One thing that is a good idea is that the water pump outlet tube's lower end that goes into the water pump grommet is cut at a slight angle. This facilitates this tube being inserted into the grommet so that the grommet does not get folded over, partially blocking the water flow from the water pump. There appears to be a change in 1958 with a different lower unit which included the water pump and impeller when the cowling was also changed. These used what was known as the 4 bolt lower unit. The earlier impeller is the same as the 10, 15 and 18 hp of the same years. And the 1958 and newer are the same as the 9.5 hp series which followed this model. The impeller used on these later motors is 2 3/4" in diameter, 1/2" thick, with a 9/16" shaft hole. This impeller has 6 vanes. In the RH photo below, note the nylon O-Ring at the top of this pump housing. 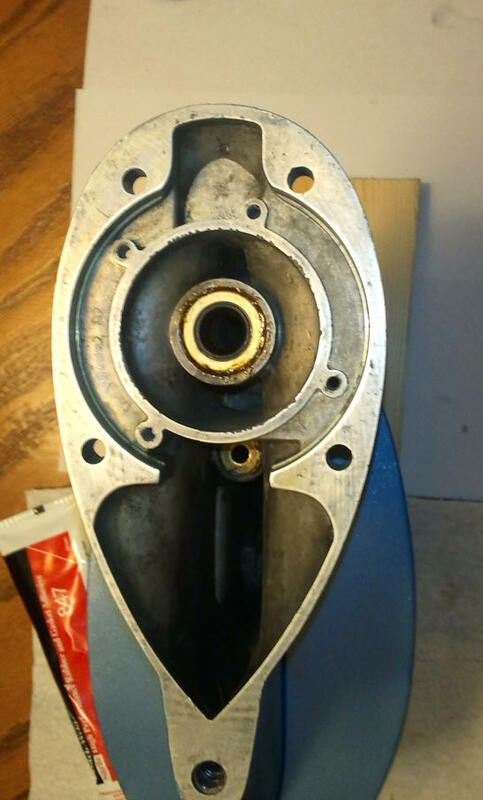 This slides into the motor's mid-section and ensures shaft alignment..
Any person familiar with normal outboard repairs should be able to replace one of these impellers in 30 minutes easy. The Clymer flat rate manual says it should take 1.3 hours. Here the Nylon water pump housing is shown on a 5 bolt unit A Nylon water pump housing assembly installed on a 4 bolt unit. It is recommended you replace the water pump to outlet tube grommet as well. This grommet is held in place by 2 "ears" on the sides that snap into matching holes in the top of the water pump outlet tube. Many times the grommet has been known to not slide over the tube properly, therefore giving a chance to allow the outlet water from the water pump to leak somewhat. So it is beneficial to grease the lower end of the tube to help it slide in better. Water Intake : These motors main water supply to the water pump comes from a screened tube right behind the prop in the exhaust outlet. Water is forced into the screened intake to the water pump by the prop thrust. Some users report that when running these motors in a barrel, (usually a small one) that the prop has to be installed and usually in gear as apparently they need to get more water pushed to the water pump by the prop to get enough to cool when running at over an idle. On the LH (port side) of the exhaust housing just above the anti-cavitation plate there thin stainless steel plate (the factory nomenclature is water bypass cover) which is held in by 2 screws. 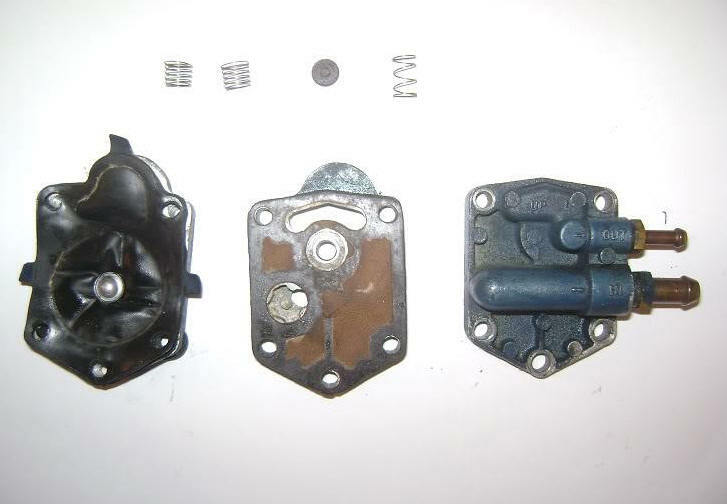 In this plate are 3 small holes that is designed to put water into the water pump when the motor is in reverse, as shown in the photo on the left below. This is common to many different size of these motors in these years up to about 1974. It was designed to supply water to the water pump when the motor was in reverse. The right photo is an aftermarket adapter (no longer available) with a 3/8" course thread usually placed in the rearward part. This allows the usage of Mercury's Quick-Silver Flushing Device described below. This flush plate is NOT designed to be used when running, but only for flushing. Since these are no longer made, you can fashion one by using the original plate as a sample and soldering/brazing, (even epoxy) a 3/8" course nut onto the outside of it to screw the flushing adapter into. The photos below on the left are from a 15hp, but the plate is the same for the 18hp. The right photo is an aftermarket adapter shown on a6hp with a 3/8" course thread usually placed in the rearward part. This allows the usage of Mercury's Quick-Silver Flushing Device described below. This 3/8" hole was not plugged with the possibility of allowing some intake water to be sucked in, or the plug got lost. Mercury sells a flushing adapter that uses a 3/8" National Course bolt thread on one end and a female garden hose end on the other. Mercury's Quick-Silver part number is #24789A 1 with the actual name being Flushing Device. Also OMC Johnson/Evinrude uses the same adapter to back-flush their 9.9/15hp 2 stroke outboard motors (and maybe more models) made from 1993 to 2007. These adapters also fit about all of the Japanese outboards that use a back-flush system. You can remove the 3/8" plug bolt, screw the garden hose into the adapter and then into the motor, then turn on the water. It does not need to be full force of the standard house water pressure, but about 1/2 force. Start the motor up, let it run for long enough to get the motor warm enough to open the thermostat allowing water to flush thru the power-head. Gearbox : If it runs pretty much OK in neutral, but bogs down in any gear, then possibly you have a lower unit / gearbox problem. Unscrew the large headed slotted screw (not the Phillips screw) in the bottom area of the lower unit. What comes out? There should be a dark thick gear oil. If it is a thick creamy color it has water inside. If no oil comes out, your unit has a leaky shaft seal, which may have let water in and then over time also drained out if not ran for some time. If this is the case then you may have a rusty prop shaft or gears. Either of these will put a lot of excess resistance on the motor when shifted into either forward or reverse, causing it to bog down. This is not a unitized gearbox like most of the newer motors, and the bottom 1/2 comes off exposing the gears. To remove this lower 1/2 remove the (3) Allen head #2 screws on each side, then the (1) Allen head #1 shifting linkage pivot screw. The lower 1/2 can now be lifted off, possibly may need some persuasion however if someone gooped the 2 parts together. The lower unit gearbox is not the unitized type as used on the later 9.9s but has a bottom section that when the unit is turned upside down, exposes all the gears and output shaft. There is a spaghetti type O-Ring that seals the grease in the lower unit when assembled. This gear case does not use a regular gasket, but a spaghetti rubber seal is .100" dia. allowing the two metals to mate tightly. This seal is purchased in bulk so you cut off just a bit more than you need. For this model 11" is enough. This seal is the same as used on all the other models that have the split gearbox, it may just be a different length depending on the size of the motor. It may do the job alone, but OMC recommended it's 3M 847 sealant, but it's kind of pricey hard to find at regular stores. Lots of folks use Permatex Ultra Black with good success and it's available at almost any auto store for just a few bucks. The main thing is that you want to keep it watertight. Also when you lay out the rubber seal in the groove, cut off just a little longer than needed as it will spread out in groove when housing is pressed together. 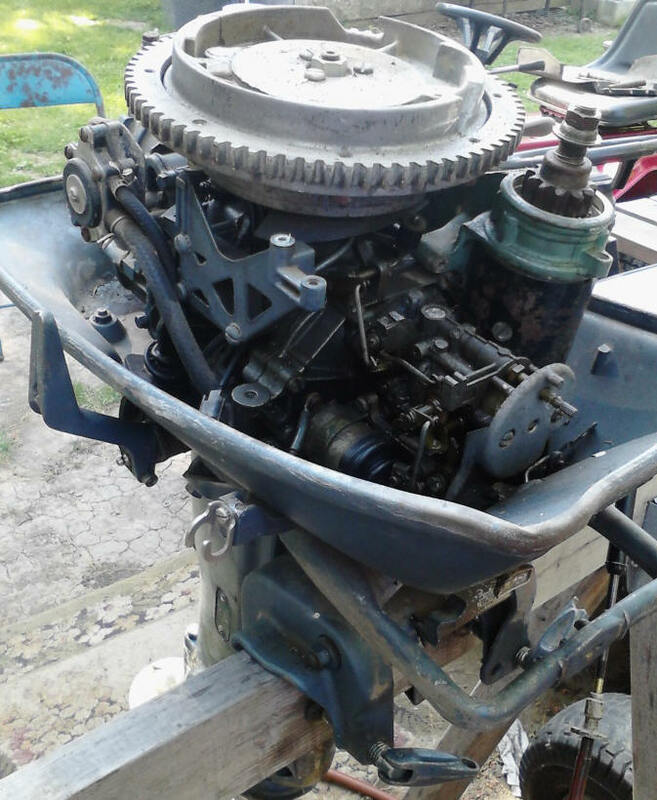 The gear box was changed in 1958 from the larger 5 bolt lower unit to a smaller 4 bolt unit. Also there was a internal change in how the pinion gear (drive gear in the gearbox) was attached to the driveshaft with it being changed from a friction fit onto the driveshaft to a splined fit. It appears that all the other gears, shaft and bearings remained the same. This change came about 1959/60, as 1960 parts list shows 2 different part numbers for the pinion gear. In the photo below, this gearbox did not have any nylon washers under the drain or fill plugs, no spaghetti seal at the juncture of the top and bottom halves of the gearbox (just Permatex and a minimal amount at that) and had not seen oil probably for a good number of years, water yes, but no oil by then. About all it is good for now is photography purposes. If your motor will not stay in or slips out of gear, you either are missing the shifter lock detent bar spring on the side of the powerhead, your clutch dog and gears are worn out, or the shift linkage is worn out. Or all three. Shaft Length Change : If you need to change from a short shaft (15") to long shaft (20"), lots of luck in finding the 5" extension required to make this change. Drive-shafts, shifting rods and water tubes can be lengthened the 5", BUT IT IS A HASSLE. Changing a long shaft to a short shaft would be easier. Here, just remove the extension, shorten the driveshaft (cut and weld in the middle) and shorten the shifting rod upper part from the gearbox and the water tube from the water pump. Welding the driveshaft (either shortening or lengthening) would be best to take it to a machine shop/welder, as afterwards the shaft will need to be straightened in a lathe by slight bending "adjustments" numerous times to get it to run as true as possible. If the welder is hesitant, then have them also make, and slide a stainless steel sleeve over the weld and weld it in place also. Just be sure this weld is up above the water pump and in the exhaust cavity area so it does not interfere with the water pump. 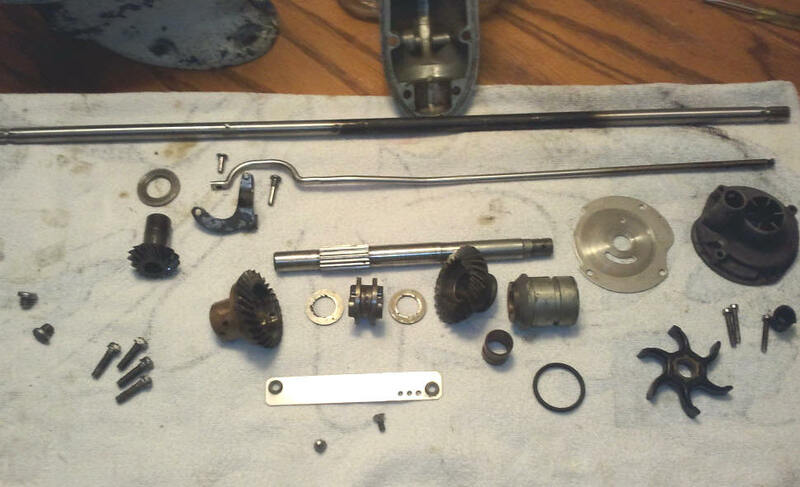 The only thing that might interfere is IF it is the version is where the lower drive gear is not splined onto the driveshaft (but pinned), replacing the water pump impeller will require total disassembly of the gearbox as it would need to be assembled differently (if even possible). 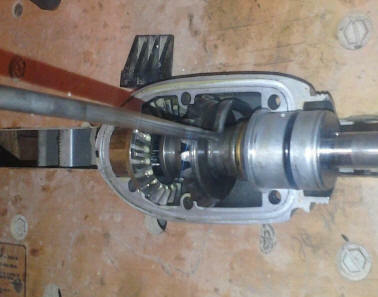 In the RH photo below, is shown the lower unit's upper driveshaft bushing and seal which sits just below the water pump. And the smaller brass bushing in the upper part of the lower cavity is the shifting rod bushing/seal. Propeller : The prop is secured by the old standard style using a cotter pin thru a plastic nose cone. It is a 3 blade aluminum secured to the prop shaft by a 3/16" dia. by 1 5/16" long shear pin. The prop overall diameter is about 9" dia. and has a 5/8" hub hole. The motor that I worked on had a distance between the transom clamp area (where the top of the boat transom would be) to the cavitation plate of 18". The owner thought it was a "Long Shaft", but upon measuring from the clamping area which would be the transom to the center of the prop it was 22", the same as most all later short-shaft motors. The difference was really that the prop was a smaller diameter with the cavitation plate closer to the prop. I also suspect that this was common before the later motors labeled "Short Shaft" became standard at 15" to the cavitation plate. The twist grip and throttle uses cog gears similar to the earlier series motors.